Phillies color analyst Larry Andersen. Say it ain’t so, L.A.
After 11 years together, the Phillies radio team of Scott Franzke and Larry Andersen aren’t exactly breaking up after the 2017 season, but Andersen will adjust to a reduced role in 2018. Andersen told reporters last week that he simply wanted more time off. The 64-year-old Andersen wants to have more free time in the summer, something that’s impossible to come by when you’ve been working in baseball in some fashion for 48 years, including the last 20 as a member of the broadcast team. According to MLB.com, he could just handle color commentary for home games next year. This creates a rather large hole in the suddenly ever-changing broadcast team (remember the years of Harry Kalas, Richie Ashburn, Chris Wheeler, Andy Musser, and very little change for forever?). Since Andersen will still be around, the radio booth will likely take on a similar form as the TV booth, with rotating analysts. Maybe L.A. shares the duties with one other commentator. Perhaps it's a trio working at various times with Franzke (which seems like too much, but there are three TV analysts currently in Ben Davis, John Kruk, and Mike Schmidt). In any event, after about a week to think about this, here are five names on our personal wishlist for the vacant spot in the Phillies radio booth. The former Phillies center fielder and New Jersey native has already worked with Franzke this summer. The Phils have basically ran an in-season audition this summer during a few series that Andersen has taken off, with Glanville, J.C. Romero, Kevin Jordan, and Kevin Stocker taking turns in radio analyst duties. Since we’re here at the ballpark during games, we can’t sit here and give an honest opinion about who the best one was of those four. But Glanville, a University of Penn grad, has always provided smart analysis on ESPN before being among the network’s layoffs this summer. His intellect has also been present in his occasional op-ed columns in the New York Times, too. We feel like Glanville could be the perfect candidate to mesh old school baseball analysis with new school analytics, too. It’s difficult to imagine there’s anyone out there that loves Phillies baseball more than Wheeler, who first joined the organization in 1971. And it’s hard to believe there was anyone more prepared than Wheeler during a broadcasting career than spanned five decades. There’s something to be said for the familiarity of hearing a voice that immediately makes you think of your childhood, falling in love with baseball as a kid, and Wheeler would provide just that in the booth, along with already having a camaraderie with Franzke. 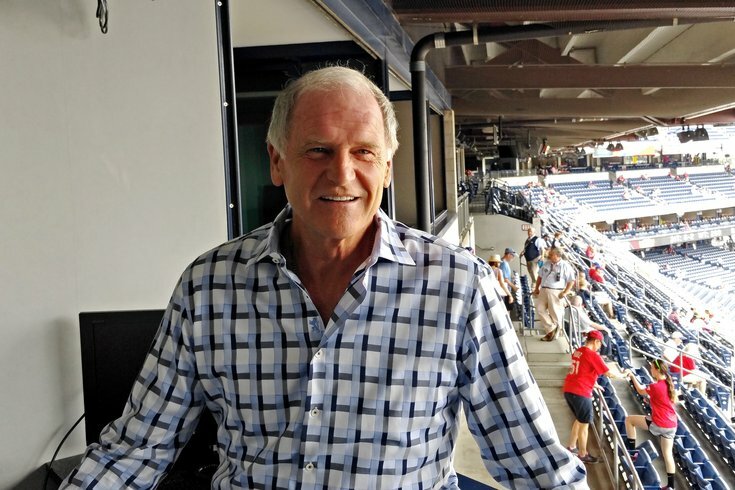 Wheeler is 72-years-old and four years removed from being in the booth (he and Gary Matthews were let go from the Phillies TV team before the 2014 season), so it’s far-fetched to think he’d want back in on traveling full-time. But, hey, this is our wishlist. Comcast SportsNet and the Phillies wanted Lidge back in January of 2014 to replace Wheeler and Matthews. And it made a lot of sense. The former Phillies closer was an extremely likable, friendly, and smart member of the most popular team in recent team history. Who better to put in the broadcast booth than the man who struck out Eric Hinske for the final out of a perfect 2008 season, dropping to his knees to accept a hug from Carlos Ruiz? Lidge does a very good job on his MLB Network Radio gig, but has said in recent years that he enjoys a more part-time broadcasting role as the father of young kids. And the Notre Dame product has with interests outside of baseball, too, namely in archaeology and ancient history. Here is an interesting interview he took part in 10 months ago with Grid/gridphilly.com. Ok, this is mostly a joke. We say mostly because it’s difficult for a lot of people to believe that Utley, who will have to retire from his playing career at some point (he turns 39 this winter), will simply walk away from the game entirely. As a broadcaster, he’d still get to travel around to all of his favorite cities and ballparks and talk about the game he obviously loves. Oh wait. He has to talk. Utley has never been a huge fan of microphones thrust into his general direction, but he can offer more than he lets on, too (often seen in one-on-one interviews rather than group sessions). Look, it’s not going to be Utley. But it would be interesting to see if the Phillies consider some of their more recently-retired stars (well, some haven’t officially retired just yet), a group that also includes Jimmy Rollins, Shane Victorino, Roy Halladay, and Ryan Howard, among others. Sometimes you put a list together and you feel really good about the names on it, but you’re searching for one last one to top it off. And then you realize that it’s probably the most obvious and best fit of the bunch. Broadcasting experience? Check. Stark worked at ESPN for nearly two decades. Baseball knowledge? Check. Stark is as plugged-in as anyone in baseball and has been for nearly 40 years working at the Philadelphia Inquirer and ESPN.com. Encyclopedia-like knowledge of the Phillies? Check. Stark is a former Phillies beat writer who wrote about baseball in Philadelphia and around the league while at the Inquirer for 21 years. He still lives in the area. Like Glanville, Stark was shockingly let go during ESPN’s layoffs in April. He should still be writing somewhere, surely, but maybe in 2018 he can be like Ken Rosenthal and write for one company while broadcasting for another.